You can make this simple fruit kabob recipe with any fruit of your choice! Check out what fruits are in season in CT and get creative with your own variation of this delicious treat! Cut up one cup of strawberries into small slices. In a small bowl, mash slices with a fork. In another small bowl, combine the vanilla yogurt and mashed strawberry slices. Set aside. Thread the fruits by alternating the pears, strawberries, bananas, and pineapple onto the skewers. Serve fruit skewers with a dollop of the strawberry sauce on the side. 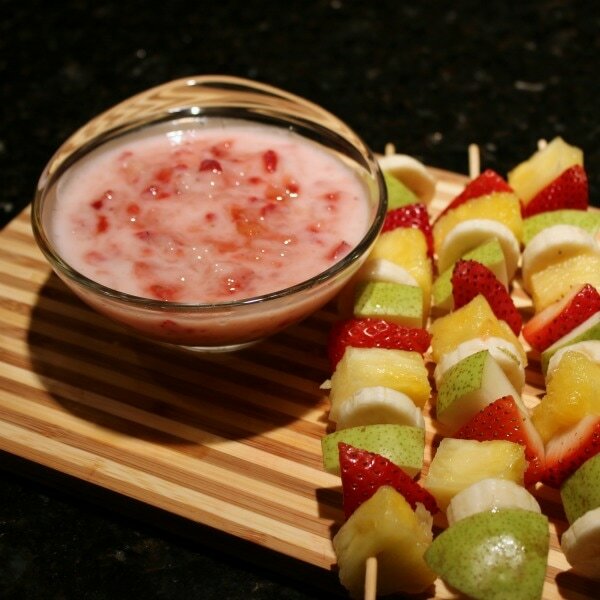 Note: If you do not have wooden skewers, you can simply dip the pieces of fruit in the sauce or make a fruit salad! Source: USA Pears. Pear Bureau Northwest.